Get your Hen Party started with these fantastic looking Miss Behave Hen Party Sashes. A satin feel, non flashing, pale pink sash with bold black writing is a sure way to get your Hen Party noticed. A sash that is easily wearable and can be complimented with our large variety of colour coordinated Pink Hen Party accessories. This sash comes in an assortment of designs making sure nobody is left out of the fun. Bride To Be, Mother of the Bride, Mother of the Groom and Bridesmaid. 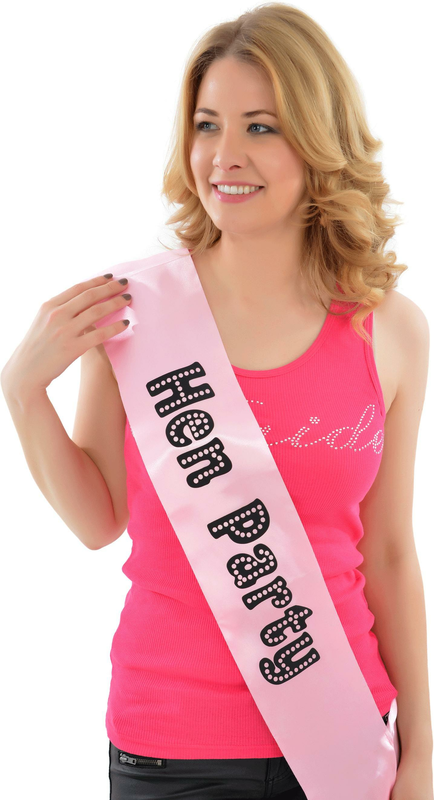 Whether your a large party of ladies or just a few in number this Hen Party Sash is a winner. The size of the sash is approx 140mm x 860mm. Showing our 4 Pink Hen Party Sash reviews with an average rating of Excellent. Would you like to write a review? Item arrived very quickly and was of good quality.. I needed these in a hurry so paid for next day delivery.. Fantastic quick service and the products were of good quality, well packaged and loved by all members of the hen party! Would definitely use this site again! Review Title - Extremely fast delivery. Review - dispatched the same day and delivered the next! Good quality. dispatched the same day and delivered the next! Good quality.